If your hair is suffering and prone to breakage while you long for stronger, shinier, healthier hair, you owe it to yourself to investigate Redken’s Extreme Hair Care products that I was sent for this review. Nothing to date in the market matches the science behind these products or the beautiful results awaiting your distressed hair once you try them yourself like I did. What makes the Redken Extreme Hair Care collection special is the unique dual-patented Fortifying Complex and Interlock Protein Network for delivering the deepest penetration of protein to your hair shaft so weak hair can become strong again as the cuticle structure is realigned and the protective lipid barrier is reinforced to prevent breakage. These products are also safe for color-treated hair, which I appreciated for extra gentleness. Coloring and spending just a weekend in the sun was beginning to make my hair brittle until this review saved it. I started with the luxurious Extreme Shampoo and followed with the Extreme Conditioner, which detangled my hair effortlessly. I followed with their reformulated Extreme Strength Builder Fortifying Mask that I left on my washed hair for about fifteen minutes before rinsing out for deep conditioning. Other days I went with their stronger deep conditioning mask formulation called the Extreme Strength Builder Plus Mask that I used the same way and loved how just a small amount was all necessary. Before I went for my blow dryer, I applied some Extreme Anti-Snap for extra heat protection and resiliency to safeguard my hair further and banish those split ends. I used the Extreme CAT protein reconstructor treatment once and kept it on for about four minutes before rinsing out. This isn’t a conditioner, but a fantastic heavy duty protein product that you will notice improving your hair’s texture almost immediately. Depending on how destroyed your hair is from bleaching or another cause, you may want to use it more, perhaps, twice than once a week followed by the conditioner. I treated my hair to the deep conditioners about three times that week because more would have been overkill. Using these products I noticed my hair had much more life and a healthier sheen to it than before I started and felt incredibly soft to the touch. I do have a lot of hair, but do shed a lot. However, I can honestly say since using this collection I haven’t found as many long hairs in my hairbrush either. 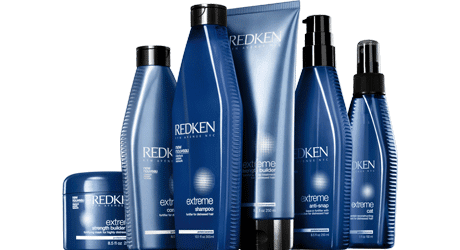 I think Redken Extreme Hair Care line can really help extremely damaged hair return to its former glory just judging by the hair miracle it did for me. If your hair is causing you grief, then I know you will love how this line works.